“Our care of the child should be governed, not by the desire ‘to make him learn things,’ but by the endeavor always to keep burning within him that light which is called intelligence.” — Maria Montessori, The Advanced Montessori Method, p. 185. This week NAMC received an email from a graduate who recently learned that one of her new students is a child who is blind. As this is a new situation for the teacher, she was feeling a bit anxious. Her main concern was how she could accommodate the child’s needs to the best of her ability in the Montessori 3–6 environment. Here are some thoughts for Montessori teachers who may have similar questions. Many of Montessori’s ideas for working with and educating children originate from her work with Édouard Séguin, a French psychologist who developed a methodical approach of presenting lessons by breaking them down into small, sequential steps. Working primarily with children who were blind, Séguin developed a collection of hands-on learning materials. Due in part to her work with Séguin, Montessori developed her method and materials to encourage children to learn using all their senses, rather than relying strictly on their vision. As well, Montessori materials developed for sensorial refinement and mathematics promote whole-brain learning. The sensorial, whole-brain foundation of the method and materials allow children who are blind to experience success in the Montessori environment. In fact, Anne Sullivan used Montessori’s model of education with her student, Helen Keller! “Helen Keller is a marvelous example of the phenomenon common to all human beings: the possibility of the liberation of the imprisoned spirit of man by the education of the senses.” —Maria Montessori, Dr. Montessori’s Own Handbook, p. 25. Use verbal descriptions about what is happening in the classroom and during daily routines. Help the child learn about the physical space of the classroom and how it is organized. Keep the room organized and neat. Provide hands-on learning and encourage exploration. Lead the child through the motions of finger plays and songs. Offer information rather than assuming the child needs help or intervention. For more suggestions, you may wish to read Adapting the Classroom for Visually Impaired Children by Pat Jenkins. 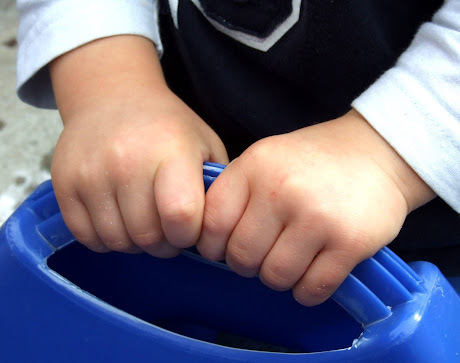 In her article, Jenkins discusses some simple techniques for modifying the Montessori materials and environment to best meet the needs of children who are visually impaired or blind. Montessori teachers are experts at meeting the needs of each individual child in their care. With just a few modifications to the environment, blind and sighted children can experience equal success, working side by side. © North American Montessori Center - originally posted in its entirety at Montessori Teacher Training on Friday, September 6, 2013. Thank you so much for this article and the related links. As I am looking for a school for my daughter, this is very helpful. I appreciate the recognition of all that she, and her peers who are blind or visually impaired, can do. Thanks for this article! My toddler is visually impaired and I am considering a Montessori school. I found this informative! It is hard for a child that is visually impaired to attend school in early childhood only when the program where he/she is enroll in is not trained. However the results of the learning process can be equally compared with the rest of the kids in his/her class when teachers KNOW how to handle it. I am visually impaired and this is not stopping me to be an independent adult, mommy of two and NAMC student to become a certified Montessori Teacher. You can tell that (hearing) this Blog was very pleasant for me. Thank you so much!